If you had a million dollars and no debt, what would you do? At age 30 I paused long enough to ask myself this question. Just ten years later, my husband and I were completely debt-free and had a million dollars in the bank. We didn’t win the lottery, inherit from a long-lost uncle, or invent the pet rock. I wasn’t born with a silver spoon in my mouth, either. When I was a child, my parents struggled to live paycheck to paycheck. My sister and I shamefully hid our free-lunch tickets, then spent after-school hours dumpster-diving behind our neighborhood grocery store. As a young adult, anxious to get out of the house and start making my own money, I dropped out of college… and landed the graveyard shift at the corner donut shop. Then I married a blue-collar construction worker. Despite the odds, I became a work-from-home small business owner and self-taught investor, and by age 40, my husband and I were millionaires. How did I go from free-lunch kid to millionaire mom? My transformational journey started when I discovered an important truth: Our lives are the stories we narrate for ourselves. If you don’t like the story your life has become, tell yourself a better one. Change starts with a thought, not an action. Think about all of the things you can do instead of the things you can’t. Start a different internal conversation and you’ll become wealthy in more ways than one. If you don’t know where you are going, there’s an excellent chance you won’t get there. You need to create a crystal clear vision of exactly what being rich is for you. Your personalized image of “rich” needs to feel so real to you that you can literally smell it, touch it, hear it, see it, taste it, FEEL it. You need to own it. Visualizing what wealth means to you shapes the way your mind thinks about money and your life. Your mind then sets in motion the actions necessary to begin achieving your goals. By taking the time to establish what real wealth looks like to you, you direct your efforts in ways that make becoming rich, in your own terms, simple. 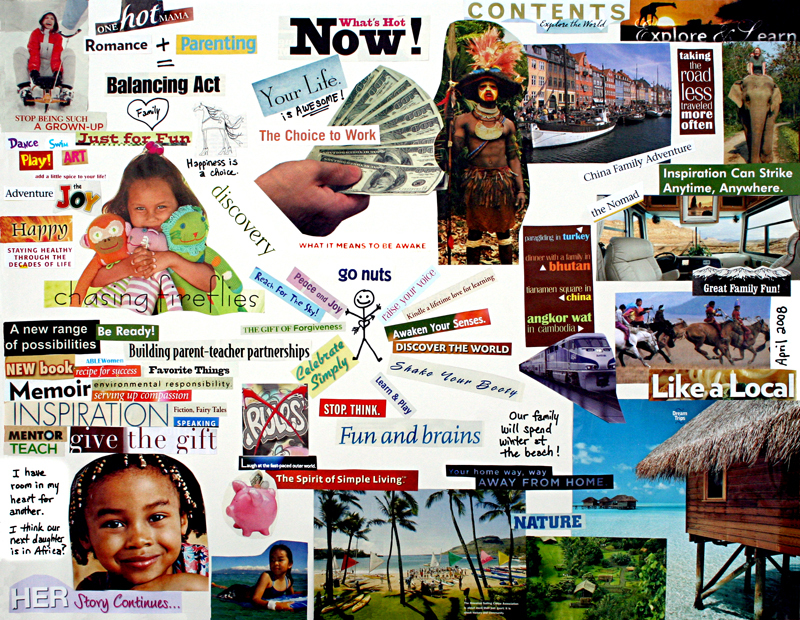 I created my first “Treasure Map to a Rich Life” vision board in my early twenties. A few years later, I was living the story I had envisioned through the Treasure Map tacked upon my wall. Every few years, life experiences modify some of my aspirations and passions and my vision of wealth and happiness change, so I design a new Treasure Map. Lo and behold, my life soon morphs to fit my new vision. And it repeats over and over again. I choose to live an enthusiastic and playful life. World travel, culture, nature and creativity continue to place very high on my list of interests. I will share my passion for lifelong learning with my daughter. The world is our classroom – we can homeschool as we travel. My heart is open. Perhaps we will adopt a second orphaned child in need of a loving family. I remind myself that romance and parenting is a balancing act. I yearn to give back and make a difference in the lives of others. I am opening the door to new possibilities – perhaps I’ll write a book, offer financial education, motivational speaking, mentoring, teaching. 1. Round up a poster board, some old magazines, scissors, glue, and colored markers. 2. Flip through magazines and cut out images, photographs, illustrations, titles, and quotes that catch your eye. Select images that evoke your feelings of happiness, phrases that put a smile on your face, and words that intrigue you. 3. Glue your cut-outs onto your poster board to create a collage. 4. Use your colored markers to add any additional words, quotes, or statements that make you feel happy. 5. Place a title on your poster board- something like, “My Treasure Map” or “My Rich Life Is…”, or “Happiness is…”. 6. Now step back and take some time to look at your collage. Do you like what you see? Do you feel happy when you look at it? If not, simply paste new images over the parts that don’t make you feel good. 7. Make a wild guesstimate. Write down how much money you think you’ll need to live the happy and rich life that you’ve just created on your Treasure Map. Don’t worry about being accurate, but do be specific. “I want to have lots of money” is not specific enough. You need to quantify how much money is “lots” for you, and include when you want it to happen. Write down some specific numbers and dates. Try something like “I want to make $100,000 next year and I want to have $1,000,000 saved by 2020”. 8. Proudly hang your Treasure Map where you will see it every single day. 9. Finally, take a photograph of your Treasure Map. Place this photo in your wallet or checkbook. Consider your map a work in progress. As you look at it daily you’re bound to change your mind about a few things and clarify some details. Just pull out your glue stick and modify your map accordingly. Now that you can visualize exactly what it is that you really want, you’ve taken the biggest step towards living a rich life. Your personalized image of wealth and happiness will drive your daily actions in simple and incredible ways. Next, I’ll explore how identifying, prioritizing and living according to personal values is key to personal happiness and financial well-being. Great post. As a child I used to do similar posters (focused on the things kids want). In the past couple years, I’ve started to do these maps/boards again. The most recent one I did focused on my new to me car and a bunch of accessories I wanted for the car. Lo and behold, I got the car plus the accessories (less one item I decided I really did not want). It works! Since I’ve been having an “off” month, I’m planning on making my next treasure map next week. I’m using this week to plan my map and gather my images. Love the new site design and love your site.! Hey, I loved this post! I quoted it, and linked over at my site. I think this is something you need to constantly remind yourself so you live life to the fullest. Having a treasure map is a great way of doing that, of seeing it in front oif you all the time and remembering your values, goals, dreams. My problem is finding the images. I only get one magazine a month, and don’t want to spend a lot of money buying a bunch of magazines! Still, I love this idea and my treasure map is coming together slowly but surely. That’s a great idea. So far I have a visual idea of where I want to be at 40 (mostly retired but able to do lots of hobbies, volunteer work and other bits and pieces). If I do this in a visual manor then I expect it’ll better equip me to aim for those goals. You’re definitely a hero of mine as I’ve alluded to on my post about who I consider rich (in a non-monetary sense). It’s all about the time to be able to do the things you want to do. BTW sorry to hear what happened to your old blog. It must be horrible to lose all those great posts!! My best wishes for your even greater success at this new URL. What great advice! You have such a wonderful site and I love all the advice. I get so inspired reading your posts. Todays blog really got me pumped. I am going to start on my treasure map today. I am a firm believer in leading by example, I hope by creating my own treasure map I can inspire my children and others around me to do the same. Thanks for sharing! After reading this post, I looked at our family treasure map and realized that in a year’s time, we have accomplished almost everything on our map. It’s rather strange because consciously I hadn’t realized that I was using this map as a guide but I guess I was. When you update your map, do you create a new one or add to the old one? Great post! The first time I read about it on your blog I sat down and went through dozens of magazines to create mine. That was early Spring 2008 and a few weeks ago I realized most of my Treasure Map had happened already. Time to start thinking about a new one. I also linked to your post on my blog so hopefully a few other people can learn about this amazing tool. I enjoyed the piece on the Treasure Map and will be trying it out. I love this! I have an “inspiration board” but this takes things one step further. My latest “inspiration” came a few months ago, when my husband and I decided to set a goal for paying our mortgage off as next year’s Christmas present to ourselves…to me not only was that inspiration in and of itself, but it makes me feel more comfortable with the idea of staying home (at least part time) with my darling daughter and maybe starting a business, which I’ve daydreamed about for years. Great post … and timely, as well. I’ve been so busy looking at tree bark that I’ve forgotten to look at things from an aerial view, so to speak. In other words, I’ve been going on automatic rather than thinking of where I want to wind up in the near to distant future. Thanks for the reminder. I can then see how you could take those ideas and create your Treasure Map in the way that you suggest, Mom. I did the treasure map last year and found it really meaningful. In fact, it was one of the steps that made me realize that I wanted to quit my job and use freelance writing, photography, and project management as my work (with more free time to have a more balanced life, as well) . . . which I did at the end of September. Thanks for posting about it. I intend to do the activity again at the start of 2009 to define my vision for the new year. I do a ‘wish list’ every year. its the same sort of thing. but obviously its just a list. but its amazing how much comes true, even some of the unlikely things! So far I have wished a baby (so didnt think it was possible at the time – now I am wishing for another! ), a house (with the full tick list of things I wanted it to have eg quiet street, near a park, gas CGH, partly modernised (but not totally done up) 15 mins walk to the train station, 3 bedrooms) and holidays in france. I am still working on the earning £50,000.00 this year! perhaps I need a visual – should really do that poster! I’ve been reading up on treasure mapping and have a curious question. Why are all the treasure maps on paper? I’ve yet to find a single computerized treasure map. Is there some reason why cutting and pasting pics from the internet onto our desktop / word / pdf does not work as well? In Catholic school in the 1980’s we had to make a treasure map only it wasn’t called that, think it was just a plain collage in those days. Your article has inspired me to make a new treasure map this weekend! Thank you!! I’ve been thinking about your Treasure Map a lot since I read your great article 3 months ago. For several reasons, I couldn’t do mine. Mostly because I NEVER buy any magazine, so where to find the input to my treasure?! Also, I don’t have a desk space at home because I don’t need it, and I could definitely not install my map at work. Today I’ve tempted an alternative that I would like to share with you. It’s a free software called “FreeMind” (just google it), it is a mind manager where you just throw all of your ideas out! You can even add cute icons and even pictures (it doesn’t resize them so do it yourself before inserting them). So now I can search the web for virtual pics and my problem is fixed, while still having some very nice & comparable (printable) result. Previous Previous post: Millionaire Mommy Next Door Hacked, Now Moved!